The first scene of Crash & Burn Stories is dependent on having a sun-bathed kitchen, and while the kitchen was lit, it was definitely not "bathed." With a zero lighting budget to create the atmosphere we needed for our opening scene, we had no choice but to move on with our schedule and hope for better light later in the day. The set was filled with a ruckus, footsteps and voices, a rhythmic chaos, chatter hung in the air filling the space with ideas, good and bad, waiting for a moment to develop. At least that’s what I tell myself we were doing. 7:30 A.M. June 6th, 2015 – Actors on set for the first time. Conner Greenhalgh (Actor - Alex Montgomery) and Liz Telling (Actor - Beverly Montgomery) were our players for day one and would set the tone for the rest of the production. 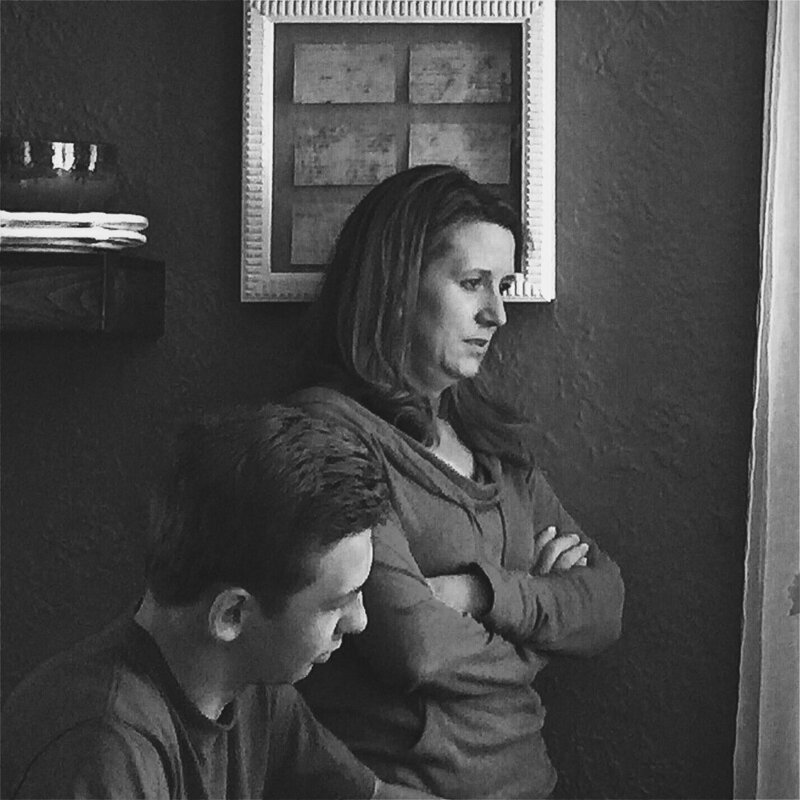 Through the corner of my eye, I watched as Conner and Liz rehearsed their lines with a playful seriousness. They’d hit a streak, then one would flub a line, and they’d chuckle at one another before flipping back through the pages ready to begin again. As I continued to watch, I’d get a flash, a recollection of the anxiety that swirled between my heart and stomach while writing Crash & Burn Stories. ”Where would we find the actors to bring these characters to life?” I’d ask myself before quieting my mind and sending my fingers back to the keyboard. Months down the road, when it was finally time to begin casting, in my quiet moments, anxiety would have its way with me. Then the actors began to appear as if they were sent to find me, and they did. This "worry" in time would become a valuable lesson, that is, to leave your problems for another day for another day. Casting – April 6th, 2015 – I received a video monologue from Conner Greenhalgh. I was unfamiliar with the monologue Conner chose to send me. As I watched his performance, I thought this young man must be really talented, or he’s making this whole thing up off the top of his head. After researching the monologue, I quickly figured out he wasn't making it up, the dialogue or his natural talent. Casting – May 7th, 2015 – Less than a month until shooting begins. The role of Beverly was a much harder nut to crack. We’d had open calls for a couple of weeks, actors coming from all over Colorado, Fort Collins, Denver, up and down the Front Range, and we just could not seem to find the right player for the part. After digging into some local theater resources and doing a little begging, I was finally granted a look at a local theater’s book of headshots. My wife and I pored through the pages of potential Beverlys when we came across Liz Telling’s headshot; my wife pointed: “Her! That’s her!” she said. As I wrote down Liz’s contact information, my wife continued to exclaim. “I’m telling you, that’s her.” As you’ve probably figured out my wife was right, that was "her." With the roar of the busy movie set bringing me back to reality, the footsteps and voices began to fade into the background; reflections would have to wait for another day. "Quiet on set!" I yelled. I stared out the basement window of my 1940's American bungalow. I watched the cool June morning give way to daylight. My wife and six-month-old son were sleeping comfortably tangled up in a mess of sheets and covers on our queen sized bed. I felt propelled with the approval of fate.